Review: I did not have high expectations for the sequel to Shaking the Sugar Tree because, in my humble opinion, equally amazing sequels following a 5 star book are just about impossible to write. I could not have been more wrong. I would give this book more than 5 stars, if possible. 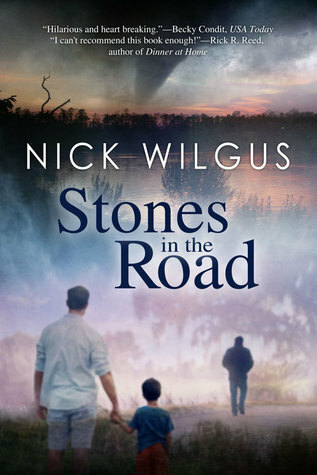 Nick Wilgus took it to the next level with Stones in the Road, and he became my newest auto-buy author. The continuation of Wiley, Jackson, and Noah’s story has them all going in the right direction, until they aren’t, and until Jackson’s “Mommy Dearest” comes for a visit. That woman was wicked evil from the get-go and I was floored that she was still alive and kicking by the end of the book. I was stricken with heartfelt pain for the way she spoke to Wiley and about Noah…and with Jackson appearing to not back them up. What kind of man allows that to happen to the man you are about to marry? But, everything is not all as it seems, you gotta keep reading. Mommy Dearest plays a huge role in this story, and if you thought Wiley was witty wait until you get a load of this broad. Dayum. But she’s only one of the many plot twists and turns that we need to navigate before everything falls, finally, into place. Wiley is still suffering from the badgering from his brother, Bill. He is still consumed by guilt for his part in Noah’s disability, and he is forever fearful of losing his son. But, during all of these heavy topics, the author sprinkles on his own form of southern humor to help soften the blow. The belly laughs make the unfairness that is Wiley’s life easier to handle. How he can take such difficult topics and make you laugh is pure genius. Stones in the Road is an amazing story of tragedy and triumph; the coming together as a family and a community; perseverance and acceptance. It’s love and fortitude in the face of bigotry and poverty. All written in a way that makes me want to jump in my car and drive to Mississippi and meet this amazing man named Wiley and his honking son Noah, and the man he plans to spend his life with, Jackson. No review, without spoilers, can ever do this book, this series, justice, but I implore you to pick it up and give it a try. You will be enriched in a way that you never knew you needed, and walk away with a smile in your heart and a laugh on your lips. Thanks for the great review! I just bought this one yesterday and look forward to it. LOVED the first book. Great review. I read Shaking the Sugar Tree and loved it. Your review makes me want to rush out and get this sequel.